In a heck of a coup by Nintendo, they have announced that four, three, two of the top 16 Bit Games by Interplay are coming to the Wii’s Virtual Console. The first is perrenial classic Earthworm Jim. Quite possibly up there with Monkey Island as the funniest games ever made, you play Jim, an earthworm, who has his life turned upside down when a spacesuit drops on him, giving him super powers. Over 10 levels you battle you mortal enemy Psycrow, launch cows into space, go to hell and back, try not to piss off Peter Puppy, and generally try and leave the galaxy in a better state than you found it. It was one of those cool games, that as well as being hilariously funny, is also tremendous fun to play. 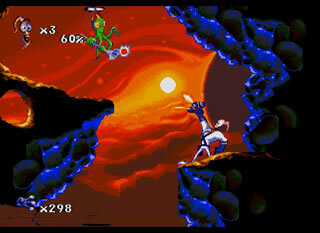 The second is Earthworm Jim 2. Similar to the first, but with about 4 or 5 kilos of cannabis smoked in development. Pinball playing salamanders, stairlift wielding grannies and your energy replaced by chip butties are amongst the features in this game. Despite posessing more of a pythonesque humour than the first game, it’s still cracking fun to play. Beat-em-up fans should be happy with Clayfighter, a rather fun, if unspectacular beat em up. Claymation techniques like used in the Wallace & Gromit films were used to simulate the eight pretty original fighters. Bad Mr. Frosty, The Blob, Icky Bod Clay and Blue Suede Goo are amongst the characters you play as. It doesn’t matter that the sequels were a bit rubbish, the first one was actually rather fun. Finally, a game I never really got – Boogerman. The game you play the rather disgusting individual who farts, burps and flings snot through levels. I’ll be honest, it did put me off as it was just putrid. Nevertheless, I’m sure somebody out there liked this. If I remember correctly too you had to wear a vest that rumbled as to give “realistic fart sensation”. Whatever. All and all, it’s a nice little gift, snagging interplay. Two games that are missing are Clayfighter 2: Judgement Clay (which actually was rather fun, only the N64 versions sucked), and Claymates – an amazing addictive and fun platformer. Will we see these on the Wii? I certainly hope so.